Want to watch video on a big screen TV from a smartphone or Windows 8.1 PC? Wirelessly outputting your device’s audio and video streams could turn any HDMI-equipped television into a full-fledged desktop or streaming media center. But not all Miracast adapters (the technology which allows display mirroring on Android) offer the same performance or reliability. To find a better performing device, we picked up three Miracast adapters and evaluated them on their performance streaming media, gaming and operating as a desktop. We reviewed the Netgear PTV3000 Miracast and WiDi adapter ($58.99), Belkin Miracast adapter ($79.99) and the Smallart PTV Miracast adapter (€49.90). Which one is the best? Read on to find out. Miracast Three Wireless Display Technologies That You Probably Own But Don’t Use Three Wireless Display Technologies That You Probably Own But Don’t Use Want to relay your smartphone's or laptop's display onto a larger screen without wires? No, it's not science fiction. You can wirelessly output video from computers and smartphones today. Wireless display technologies use WiFi to... Read More gives Android, and other mobile devices the ability to wirelessly mirror video and audio to an external monitor. The technology behind Miracast, known as WiFi Direct, broadcasts over either 2.4GHz or 5GHz frequency and uses the same technology as your WiFi adapter. Because Bluetooth broadcasts on the same frequency as the 2.4GHz band used by wireless-N and wireless-G devices, you may experience difficulty using both Miracast and Bluetooth peripherals simultaneously – there’s no official support for both. However, I have had some success using both Bluetooth and wireless display. Your mileage may vary. In recent news, Intel chose to merge the WiDi wireless display standard with Miracast, resulting in Windows 8.1 receiving Miracast support on a select number of wireless adapters. Miracast adapters allow users to display video and audio feeds on larger screens. The adapter plugs into the monitor or HDTV using HDMI, which aggregates video and audio feeds into a single cable. This system allows users to operate their monitor using their Android device as a wireless remote. It also eliminates the need for many streaming devices, such as a Roku Roku 3 Review and Giveaway Roku 3 Review and Giveaway As more content becomes available online, the need for a traditional television subscription may not be enough anymore to justify the costs. If you’re already subscribed to services like Netflix or Hulu Plus, now may... Read More . Miracast suffers from a variety of compatibility and functionality issues: First, whether or not Android or PC devices work with adapters depends on the Android operating system version or the specific kind of wireless adapter used in a Windows 8.1 system. Second, adapter compatibility varies by device – so some adapters will work with some devices but not others, even with the same operating system. Third, with Android devices there’s a great deal of video latency, meaning you’ll notice a half-second of delay between when video shows on the mirrored device and the big screen. On PCs, however (depending on the Miracast adapter) there’s virtually no latency and even gaming is possible. The Netgear PTV3000 released in 2012 and yet continues to offer some of the deepest specifications out of all the wireless display adapters on the market. It includes support for both Intel’s WiDi display technology (which merged with Miracast in version 3.5) and Miracast display mirroring. On top of that, it also offers dual-band support, meaning it can stream video over both the ubiquitous 2.4GHz band and the 5GHz band. Netgear also continues to release firmware updates, despite its age. The Netgear Push2TV PTV3000 comes in a small, rectangular form-factor, about the size of a large eraser. The sides and upper surface of the PTV3000 use a glossy, black plastic. The bottom is covered by a rubber-like substance, ostensibly to prevent it from sliding around when stationed on a table. Unlike the other two adapters reviewed in this article, it uses a standard HDMI cable to connect to a monitor (not included). It also features a firmware update button, which if held down, flips the device into firmware update mode. Ports: micro-USB power and HDMI out. LG Nexus 5: It worked perfectly with my Nexus 5 using the latest build of KitKat. ASUS Nexus 7: The PTV3000 worked perfectly on the second generation Nexus 7, using the latest build of KitKat. BLU Life Pure: The PTV3000 also worked perfectly with the BLU Life Pure. I also tested it with the BLU Dash 4.5, and it worked perfectly. Like most single-band Miracast devices, simultaneous use of both a Bluetooth keyboard and Miracast is disabled. The performance of the PTV3000 is very good. While playing Netflix, I encountered a small amount of glitches and framerate drops. It also suffered from similar lag issues as the Smallart PTV. It also couldn’t reliably operate as a desktop because of latency issues when using a Bluetooth mouse. Streaming Video (Netflix): I didn’t notice a great deal of stuttering or framerate loss while using the PTV3000, although small amounts occurred. Gaming: Gaming using the PTV3000 won’t work for games requiring reaction time. Other games will work, but the latency – as with the other devices – is high enough that it detracts from the gaming experience. Desktop: Like with the other adapters, there’s a great deal of latency when using a Bluetooth mouse. The Belkin Miracast adapter comes in at the highest price of $79.99. My testing showed it functioning on par with the Netgear PTV3000, although there were a few problems. Belkin’s adapter uses a Samsung 1544 wireless display. The Belkin adapter offers the best looking appearance out of all the adapters reviewed. Its external design uses minimal lines and high amounts of gloss. The black plastic exterior looks sleek and pleases the eye. LG Nexus 5: Belkin worked perfectly with the Nexus 5 on both the 2.4 and the 5GHz bands. ASUS Nexus 7: Belkin worked perfectly with the Nexus 7 on both 2.4 and the 5GHz bands. BLU Life Pure: Belkin worked perfectly with the Life Pure on the 2.4GHz band. Like most single-band Miracast devices, simultaneous use of both a Bluetooth keyboard and Miracast is disabled. Belkin’s Miracast adapter offers similar performance to the Netgear PTV3000. It streams video well and completely fails at gaming and operating as a desktop with Android (like all Miracast adapters). It suffered from a few problems in Windows 8.1. Streaming Video (Netflix): The Belkin adapter worked about as well as the Netgear PTV3000. It streamed media perfectly without much interruption, frame rate loss, or distortion. Gaming: Gaming remains impossible using any kind of Miracast adapter. You could play Angry Birds, or perhaps even a tower defense game, but forget about any title requiring lighting fast reflexes. Desktop: Using a mouse with any kind of Miracast adapter doesn’t work properly. The latency experienced between physically moving the mouse and the mouse’s on-screen cursor seem completely disconnected. I found myself moving the mouse and then waiting a half second for the adapter to catch up. In short, you can’t use a Bluetooth mouse in Android. However, in Windows 8.1, device mirroring worked perfectly, except for the duplication of a mouse cursor. One mouse cursor suffered from high latency, similar to Android, while the other worked perfectly, but couldn’t be used to click on any on-screen elements. Editor’s note: We originally purchased the Smallart PTV from eBay US for $39.99 but it’s currently out of stock. Our search led us this eBay DE listing which offers the PTV-02 for €49.90 with shipping within Europe for €4. Alternatively, we also found this $46.54 EnyBox PTV-02 Miracast adapter which looks exactly like the Smallart PTV but has been rebranded. PTV stands for “Push to TV”. This relatively unknown stick-style device cost the least out of all the Miracast adapters I’ve reviewed. It also includes several other features, including DLNA. Smallart also added AirPlay support in a recent firmware update. The “stick” form factor looks quite similar to stick-PCs, which frequently run Android (what is a stick-PC? What Is An Android Stick Computer, And How Can You Use It? What Is An Android Stick Computer, And How Can You Use It? Miniaturization has been a computing trend for decades, but it seems to have accelerated over the past five years. Even Intel’s NUC (Next Unit of Computing), a hockey-puck sized PC, looks large compared to ARM... Read More ). We’ve reviewed several great stick-PCs Rikomagic MK802 IV and MK812A RK3188 Android Smart Mini PC Review and Giveaway Rikomagic MK802 IV and MK812A RK3188 Android Smart Mini PC Review and Giveaway A complete Android system for your TV - not a Chromecast, not an adapter for your phone – no additional hardware required. 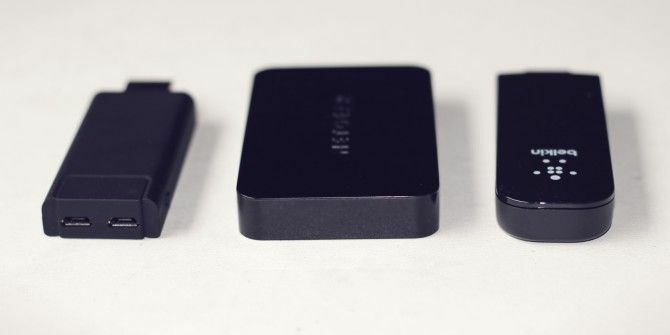 Android "TV sticks" are mini computers running Android. They have no screen, instead... Read More , some of which include Miracast support (look for Android 4.2 or better). These make for great streaming media centers Got A PC-on-a-Stick? You Can Turn It Into A Roku-like Media Streaming Device For Free! Got A PC-on-a-Stick? You Can Turn It Into A Roku-like Media Streaming Device For Free! Getting your stick computer streaming media requires very little effort and money nowadays. Considering that it provides an excellent replacement for a more expensive device, getting a stick PC can actually save you a fair... Read More . Overall, the Smallart PTV runs smoothly and without much issue. The Smallart PTV’s stick-sized form factor gives it an edge over the Netgear Push2TV PTV3000. It features a soft, black plastic shell and a removable cap over the male HDMI port. You can either plug the adapter directly into an HDMI port on your TV or use an extension cable for tightly fitted ports. Like almost all Miracast adapters, it receives power from a USB port. Some TV’s USB ports don’t supply the required amount of power, in which case you plug it into a wall socket using a (not included) 5v adapter. Ports: Standard micro-USB, micro-USB power and HDMI out. Other features: DLNA, currently in the process of adding AirPlay support via firmware update. Given the weak hardware, it’s surprising that it handles video so well. Rockchip, the ARM CPU manufacturer, sells a Miracast dongle with comparatively amazing specs. But in my testing, Miracast devices don’t differ a great deal in terms of performance. LG Nexus 5: On the Android 4.4 firmware, the PTV failed to properly pair with the Nexus 5. In the past, I’ve had similar issues with Miracast pairing using the former model, the Nexus 4, with another Miracast adapter. ASUS Nexus 7: The Nexus 7, using Android 4.4, paired perfectly with the Smallart PTV. The pairing process went smoothly. BLU Life Pure: The Life Pure easily paired with the Life Pure. I also tested using a BLU Dash 4.5 (our analysis of the BLU Dash 4.5 Can The Cheap Blu Dash 4.5 Android Smartphone Compare With The Nexus 4? Can The Cheap Blu Dash 4.5 Android Smartphone Compare With The Nexus 4? Blu Products just released the Blu Dash 4.5, an unlocked quad core Android 4.2 smartphone for $139.99. For budget devices, it offers great value: The phone features all the components of a modern smartphone, and despite its... Read More ), which also paired easily. Like most single-band Miracast devices, simultaneous use of both a Bluetooth keyboard and Miracast is disabled. In general, the PTV’s performance exceeded my expectations. I found that with few hiccups, it was able to stream Netflix. Although lag marred its performance gaming, it functioned adequately for desktop computing (without a Bluetooth mouse attached to the mirrored device). Streaming Video (Netflix): Streaming Netflix on the Smallart PTV went well, with a few exceptions. While streaming, occasionally there’s a small amount of framerate loss and glitches. However, for the most part the streaming experience went smoothly and without issue. Gaming: Gaming on any Miracast adapter suffers from great amounts of latency – meaning you experience a delay from when images are displayed on the Android device and when the adapter displays them on the monitor. This may work for games not requiring lightning fast reflexes. Desktop: Bluetooth mice won’t work, although you can use a Bluetooth keyboard. However, keep in mind that not all Android devices with Miracast support can simultaneously use both a keyboard and mouse. The devices that can seem to use a dual-band (2.4 and 5GHz frequencies) adapter. We’ve written about dual-band routers How Dual-Band Routers Can Solve Your Wireless Woes How Dual-Band Routers Can Solve Your Wireless Woes Using a router that supports the dual-band standard can significantly boost your Wi-Fi speeds in many circumstances. Read More before, but essentially, it appears that devices using the 5GHz band perform better, with less interference from Bluetooth or other wireless devices (which broadcast on the oversaturated 2.4GHz band). Netgear’s PTV3000 offers the best bang for the buck. For Android devices, it’s comparable to the Belkin adapter. For Windows 8.1, it’s clearly superior to the more expensive Belkin Miracast adapter. It also includes WiDi support, frequent firmware updates and a more flexible price – some retailers carry it for $39.99. iOS owners are better off with the Smallart PTV because of its AirPlay support. Alternatively, I also recommend buying the absolute cheapest adapter, designed by Rockchip. While I didn’t get an opportunity to test it myself, at around $20 on eBay it offers powerful specs for a Miracast adapter. It’s at least worth checking out. And before buying, be sure to check whether your device is compatible with the adapter. MakeUseOf recommends: If you want to play games or use your Android device as a desktop, we recommend the Netgear Push2TV PTV3000. For those of you with both Android, Windows 8.1 and Airplay, I suggest the Smallart PTV. Alternatively, check out the Rockchip Miracast adapter on eBay, which offers powerful specs at bargain basement prices. How do I win the Netgear PTV3000, Smallart PTV and Belkin Miracast Adapters? This giveaway begins now and ends Friday, February 28. The winner will be selected at random and informed via email. View the list of winners here. Congratulations, Rust Hawk! You would have received an email from jackson@makeuseof.com. Please respond before March 16 to claim your prize. Enquires beyond this date will not be entertained. I recently purchased the Netgear PTV 3000 for use on my Kindle Fire HDX. It would not work no matter what I did. It would not even allow me to download the latest software. Getting support from Netgear was a nightmare. After waiting for an eternity to get to a tech person and finally proving that I purchased it from AMAZON( to get the 90 day free tech support), I was sent from one tech person to another. The last one indicated that I needed to download the latest software to my laptop. I indicated that I had a MAC. They said it would not work and to access a Windows PC . Luckily my wife has one. That PC would not work and I was told that I did not have a latest adapter for windows ( the PC is Windows 7) and that I would have to download a new WIDI adapter. First they told me that it would cost $70, and then when I balked, $39.. Even after that, I was told that if this software did work to enable the PTV 3000 to actually work, then they would charge me additionally ( over $100), since the 90 days that came with this unit was limited support. I had them cancel the trouble ticket, called AMAZON, and returned this unit. Too bad because I had high hopes for this device. Am now looking for an alternative. Belkin Model, as I agree with Kannon that it appears to be a better engineered device compared to the others. I'd definitely go with Netgear PTV300 because it seems the most complete one of three. I would buy the Netgear Adapter because of the frequent firmware updates. Which would I purchase? At the moment, I don't see any need to purchase any of them but if I had to get one, I would prefer to test them all before choosing. If that's not possible, then I would follow your recommendation and pick the Netgear Push2TV PTV3000. The NetGear PTV3000 loved the review and would have to agree, also my NetGear components have never let me down. of course the Netgear...based on the review it's most compatible with my stuff and the best performing of the bunch. None, actually. These devices are so inefficient -according to this review- I'd only appreciate them if I got one as a gift. I've had good experiences with Belkin products in the past, so I would go with that. Netgear Push2TV PTV3000 because I take care for my money. Netgear PTV3000, because of your review. Thanks! Netgear PTV3000, because it seems to be the best. I was looking for a Miracast solution about a year ago and could really have used a review like yours back then. As it was I didn't buy any of the products then available. Based on your review, I would and my still buy the Netgear product. Netgear because it has good reviews. Smallart PTV. I like the design more compared to the other two. Belkin Miracast .. cause it is good and my network is also of Miracast..
Smallart PTV, since I have some iOS devices too. I'd probably go for the Netgear because it has more support. You gave the Netgear PTV3000 the best review, but, for me, it all comes down to the device compatibility. Netgear - just cos of previous good experience when using their products. Netgear. No space on the back of my TV to plug device straight in to HDMI port. I'd probably buy the Netgear PTV3000 because of your recomandations. Netgear is the best of these! Have tested recently. Want it! The NetGeat PTV3000, I need it most on my work, especially when giving business presentations..." A Must-Have and hope to win it! The smallart PTV because I have Windows 8.1 and Android. I would probably choose Netgear based on its better stats but wish it was more compact like the Belkin and Smallart. Netgear Push2TV PTV3000. I prefer to use WiDi. I would go for netgear adapter because of the performance and ease of use . I think I would start off with the Smallart PTV because of the price and also because I could lend it out to my daughter who could use it with her iOS devices. Then if the technologically worked right for my devices, I would upgrade to the Netgear. Probably the netgear for the Nexus compatability and cheaper price. I would try the Belkin to begin with. The Netgear PTV3000 because of its high technology! Netgear because they make good, reliable products. I would buy the Netgear, having used their products in the past. I’d get the netgear. I’ve had good luck with netgear products int he past. I'd get the netgear. I've had good luck with netgear products int he past. I would go with the Netgear, because they make quality products, and they even update their firmware. I'd buy the Netgear because I know they have good quality products. I really want to win this Giveaway. Thanks. Netgear, you never have to guess on quality with netgear. I liked netgear, but they tend to give up supporting their items quickly with firmware updates. But otherwise ive never had too many problems with their products. is reliable, and very cost effective. Netgear it seem to be the better one. Netgear 3000 seems to be the best and it would be better with my phone. I think I'd wait until devices can stream wirelessly without stutter. A bit of lag I can handle, but flickering breaks immersion. Belkin looks good to me. I would purchase the netgear, its obviously better equipped for future proofing and netgear seem to be keeping on top of updates. I would like the netgear one if money was not a problem, but if I was to buy one, it would probably be the Rockchip, because it is easily available at a really cheap cost. Netgear 3000 appears to be best price and decent performance. The Netgear’s PTV3000 looks the best based on performance/price. Belkin...always have used their products and its worked for me. Netgear, because it is suitable for my needs! Netgear ptv3000 since you highly recommended it and i trust makeuseof. If I buy, it'll be Netgear PTV3000, caz I'll be able to use Android device as a desktop. I would buy the Smallart PTV Miracast adapter because of it's price. I already have a Chromecast for Netflix, so I would only use the Miracast for sharing my screen and maybe some pictures/videos from my gallery. Netgear PTV3000 - quality brand - stable work - more futures! Love it !! !Must have NOW!!!!!!! Netgear since it seems the nicest. I honestly don't know which one I would buy w/ my own money. Rockchip Miracast adapter because it offers the best value per specs. The Netgear PTV3000, because it seems the best match for my Android devices. Netgear PTV3000 for game play. Netgear! It seems to be the most stable. Netgear PTV3000 because it looks easy to set up and use. Always had success with Belkin, so I'd probably pick it! I like Netgear PTV 3000 as it is simple. I'd probably pick the Netgear PTV3000 because it has the best combination of features. I would buy the Belkin Miracast adapter because it is the best. For me its the Netgear PTV3000. From your review and research it is the better of the three, and it would allow me to cast my phone or tablet to my TV real well. Netgear 3000 because it's updated more often compared to the others. Netgear Push2TV because its easy to use. Belkin. I don't like this brand but between it and the netgear one, I like the stick design more. Smaller and one less cable. I would most likely buy the Netgear because we are an Android household. I would be most likely to buy the Netgear PTV3000 because even though it's not the cheapest, I think it offers all the features I would be interested in. Netgear Push2TV PTV3000 so I could mirror games without lag please, thank you. If I had to, I would buy the NETGEAR but if you just ask me I don't want to buy any of the devices. The Netgear Push2TV PTV3000 for the gaming. All of them just sounds so bad and I already complain so much about lag I don't know if I could stand it streaming with these things. The Rockchip Miracast adapter seems like the least risky option. I probably won't even consider any of them after reading what I just read but I had to choose one. I don't have a mainstream phone so my choice would be the Netgear PTV3000. I prefer having something that will stay up to date with my ever changing environment as well. The Netgear Push2TV PTV3000 looks like the longer-term best bet, based on its features combo and support. I would chose the Netgear PTV 3000 based on what you said, however my currently Netgear brand adapter never worked properly. I've been checking on the different devices, but by watching your review I now know what I need, so that I can make my choose one which one I will need. It would be the Netgear Push2TV3000. Netgear is the obvious winner here. Push2TV PTV3000 awesome as for me! Gaming!!! Id buy the SmallArt PTV because it seems to have less frame loosing, and more continous playback. Has more features for less price. Firware updates provide it more functionallities. None of these adapters will work well for gaming, unfortunately, unless you're using Windows 8.1 and Miracast. Definitely the Netgear Push2TV PTV3000. The review seems to favor this one the most overall. Netgear PTV3000, because it is one of the best brands. I would probably go with the Netgear PTV 3000 based on your review. Netgear Push2TV PTV3000 because it would be best for me. I'd buy the Belkin. Why? I trust the Belkin name to produce quality products at a decent price. I'm familiar with NetGear products and would probably get this one. Definitely I would buy the Netgear Push2TV PTV3000, because it seems more reliable and it is a company I trust and have heard of before. I have tested a friend's device and it works pretty well! For me the Netgear Push2TV PTV3000 would be the better choice. I like Belkin products - so Belkin. Netgear because they are my favorite brand out of the three. I would go with the Netgear, based on your review. I would probably go with the Netgear PTV 3000 based on your review it would be the one for me. If I ever bought one of these, instead of a Chromecast, it would be the Netgear device, just due to the reliability of the brand overall versus the others. Don't want to feel stuck in any of the situations. Netgear’s PTV3000 looks like a definate winner to me,the others are good but not that good. The Belkin! This brand has always worked well for me in the past! I am currently using a Netgear router. I have had no problems with it and would probably get the Netgear. Netgear, because of compatibility and price. PTV3000 - I already own it as of a few days ago. The adapter works with my Dell Venue 8 pro as well as my Nexus 5, Nexus 7 and Note 2 Pro. Of the three, I'd probably buy Netgear's PTV3000; better quality than Belkin, and a good brand name. The Netgear PTV3000 because you give it the best rating. Thanks for the correction Lee! I have an FHD Nexus 7, so it looks a LOT like my Nexus 5. I keep thinking that LG makes both of them. I need more sleep. Netgear one looks cool. And probably the best among the bunch. Were I to purchase one of these adapters myself, I would choose the Netgear PTV3000. It certainly appears to offer the best features and performance for its price. Netgear because I like Netgear's products for the most part. Netgear’s PTV3000 because of the "bang-for-buck" factor. It seems to me that all three do their job succesfully.